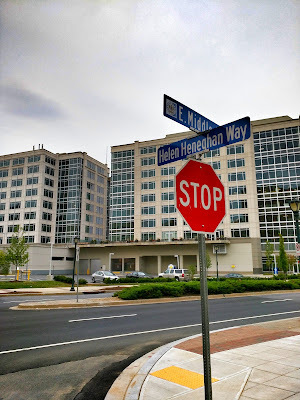 The City of Rockville has acted quickly on the renamed street running down the middle of the Duball, LLC developments between Regal Row and Rockville Town Square. Signs bearing the new name, Helen Heneghan Way, have been installed less than 30 days after the city's Planning Commission voted to give Renaissance Street the new moniker. The change was made at the behest of Choice Hotels, which didn't like having the street by its properties labeled for a competing hotel brand. Potomac Grill has closed in the Talbott Shopping Center on Rockville Pike. The traditional steak and seafood restaurant lasted a decade, which many restauranteurs will tell you is an impressive accomplishment in the industry by itself. Owner Scott Blaugrund says he and his family are "heartbroken" to say goodbye to loyal customers. The exit also leaves Talbott Center with a significant vacancy to fill for the time being. 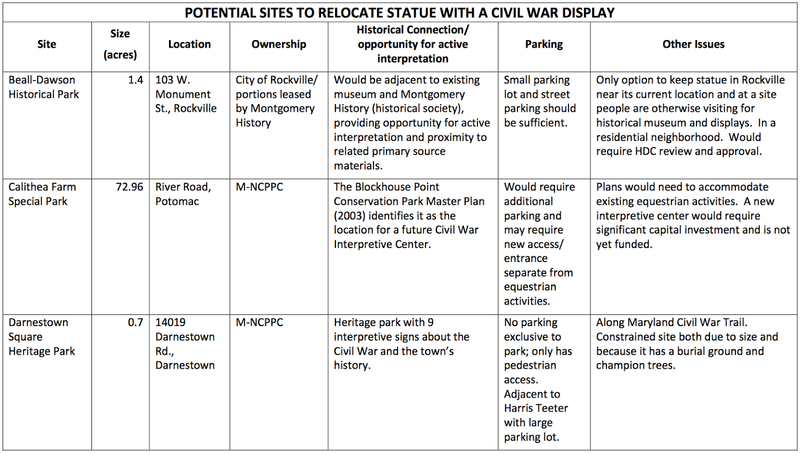 MoCo planners recommend moving Rockville Confederate statue to Beall Dawson House, or "private entity"
Montgomery County planners are recommending the Montgomery County Planning Board endorse moving the controversial Confederate statue from the Red Brick Courthouse to the Beall Dawson House in Rockville. As an alternative, they suggest giving it to the United Daughters of the Confederacy, or another private owner. As a last resort, they recommend relocating it to one of two possible County parks, in Potomac or Darnestown. 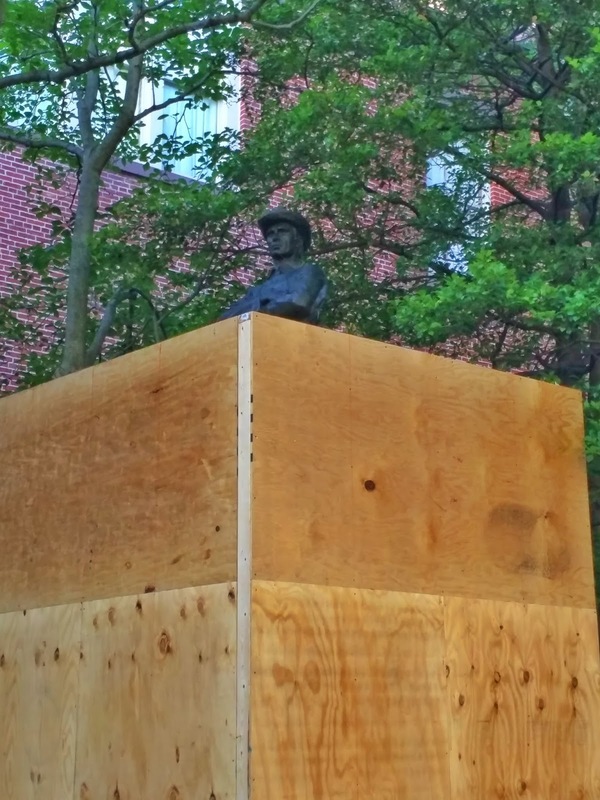 Such a move is hardly agreed upon yet, but any removal of the statue will have to go through the Rockville Historic District Commission. 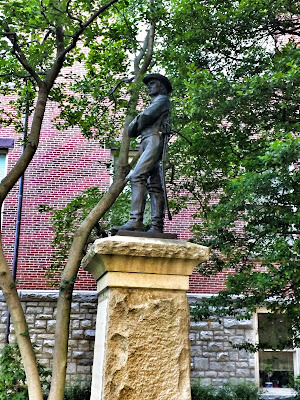 That body - mostly unknown to the public, but well-known to readers of this blog, which covers its meetings regularly - has jurisdiction over the Rockville Old Courthouse Historic District, in which the statue currently stands. The statue itself is owned by Montgomery County, as is the property it rests on. 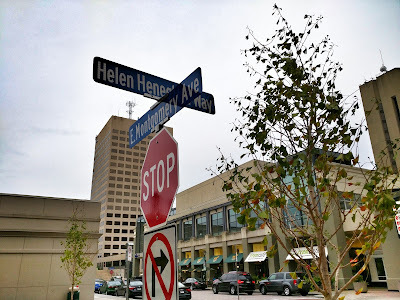 Montgomery County Council staffmember Marlene Michaelson was directed by Council President George Leventhal this summer to convene a committee, to discuss the relocation of the statue. Michaelson began a site search, and inquired about one in particular, Woodlawn Manor Special Park. Powell is also a commissioner on the Rockville HDC. 1. Beall-Dawson Historical Park in Rockville. 2. Callithea Farm Special Park in Potomac. 3. Darnestown Square Heritage Park in Darnestown. 4. Jesup Blair Local Park in Silver Spring. 5. The Edgewood Farm (privately owned) in Gaithersburg/Unity. Some participants expressed concern that the County would lose control of who could access the statue, should the private owner wish to restrict public access. The County might also lose the ability to provide context in any display of the statue, with some worrying the display could continue to be offensive to some. Others felt the statue should remain where it is, with better interpretive display elements. A chart is scheduled to be posted on the Montgomery County Council website next week, to allow for public comment. If you can't wait until next week, comments on the statue can be sent to Council President George Leventhal / Montgomery County Council / Re: Confederate Statue / 100 Maryland Ave. / Rockville, MD 20850, or by email to county.council@montgomerycountymd.gov. Montgomery County's Department of Parks has stated it does not believe the statue should go to a public park in the county. Callithea Farm is primarily an equestrian facility on River Road, and the statue would have to be fenced to keep visitors separated from pastured horses. The park is adjacent to the Camp at Muddy Branch site, a Union camp during the Civil War, and a trail would have to be built from Blockhouse Point Conservation Park (the modern location of the camp) into Callithea Farm. No lighting could be used, as it would attract insects that carry diseases afflicting horses. Darnestown Square Heritage Park seems an unlikely location, as it is adjacent to a Harris Teeter-anchored shopping center on Route 28. 18,000 Union soldiers camped there, but does that make sense as a tie-in when you consider the statue remembers Confederate soldiers? Wouldn't the risk of vandalism - likely to persist at almost any publicly-accessible location, particularly with the media attention and controversy - be high there, as well? There is no vehicle access at this site, either, and it contains a cemetery at which the grounds may not be disturbed or altered. Jesup Blair Local Park is a more accessible location, in a higher population area - which obviously would increase the vandalism risk, as well. 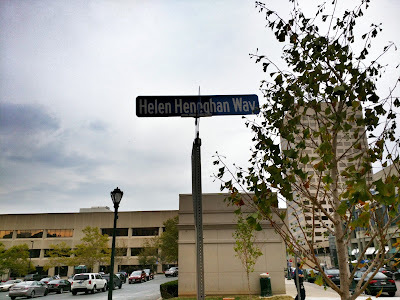 Located at Georgia Avenue and Blair Road near the D.C. line, the park is named for a member of the famed Blair family, which has been extremely prominent in county and Maryland history - including during the Civil War. That connection, and specifically, the Blairs' close ties to the Lincoln administration (and the fact that Montgomery Blair's house was burned by the Confederates), make this again seem like a downright nutty context for a Confederate statue. In my opinion, at least. 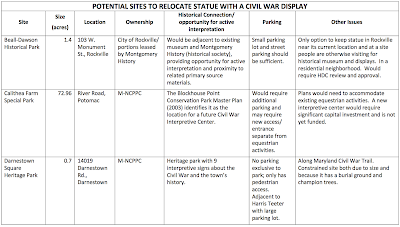 Planning staff is discouraging placement of the statue at any of these 3 County parks. Their top recommendation is to move it to the Beall Dawson House, or transfer it to the Daughters of the Confederacy or another private owner. If it is necessary to utilize a County park, however, staff is recommending Callithea Farm - but only if "it can be housed in a true Civil War visitor center." That would require the statue to be stored at County expense until such a facility could be funded and constructed. The second choice of planners is Darnestown Square. They are recommending the Planning Board ask Leggett and Leventhal to remove Jesup Blair from consideration. 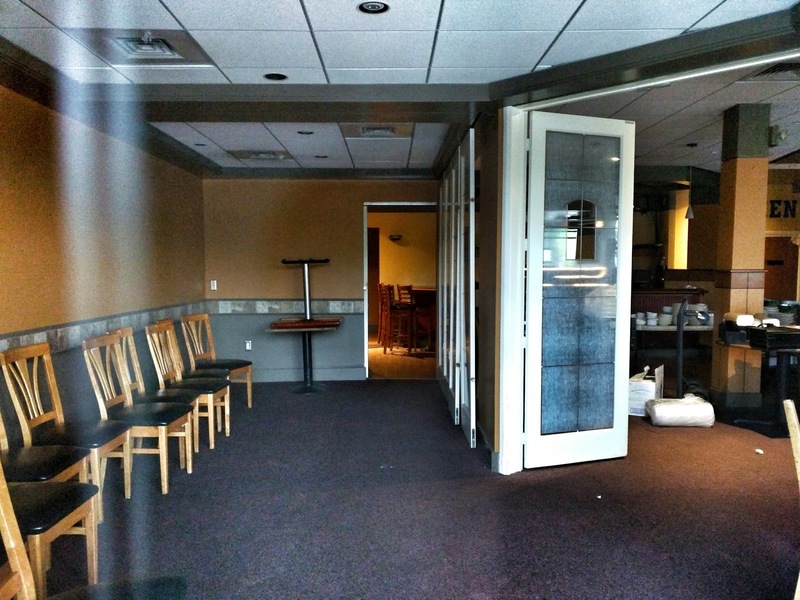 Leggett is expected to appear before the Rockville HDC at its September 17 meeting. The County Planning Board will discuss the matter and vote on their recommendations at their September 3 meeting. 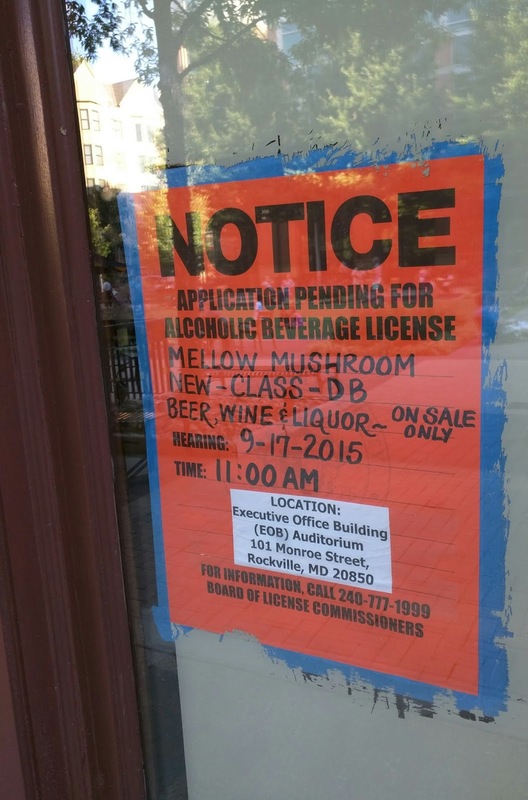 Finally, some signs of life at the future site of Mellow Mushroom in Rockville Town Square. The eccentric Southern pizzeria has applied for its liquor license from Montgomery County. Their hearing is scheduled for September 17. 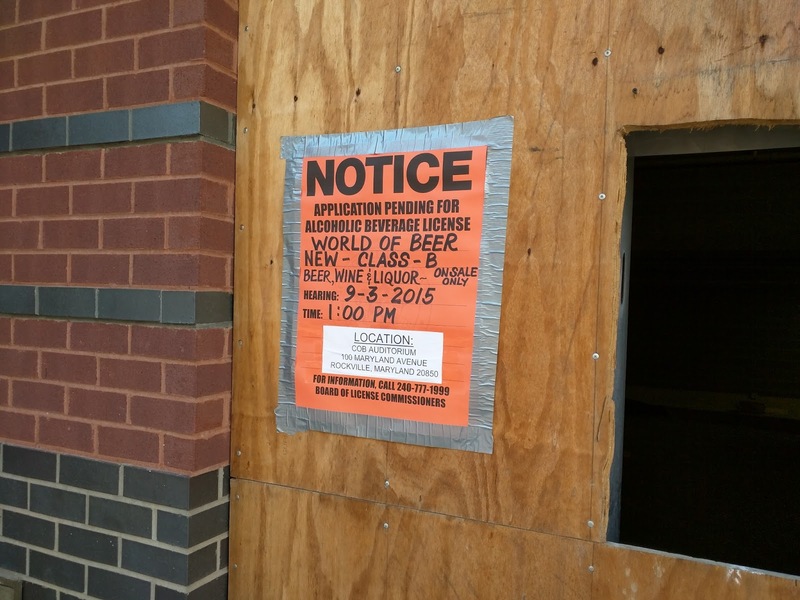 "550+ beers from around the world" - under the Montgomery County liquor regime? I've gotta see this. But that's what World of Beer is promising. 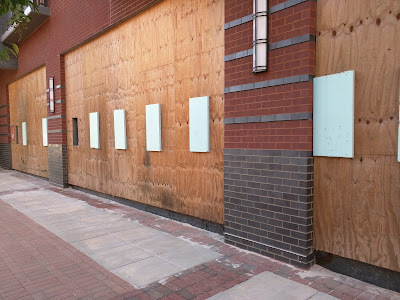 A liquor license application sign announcing the restaurant's future arrival was posted on an unfinished storefront in the Upton apartments, across the street from the Regal Rockville theater. It's not yet known how World of Beer will keep its promise with MoCo's famed liquor challenges, which leave many bar owners with empty taps when their special orders can't be filled. But the beer list from World of Beer's Arlington location tempts one to imagine having an 1809 Berliner Weissbeer or Eggenberg or Heavy Seas Fielder's Choice on the patio this fall. Dining options at the Arlington location include their signature German Pretzel with choice of mustards, sriracha lime shrimp tacos, and Belgian Waffle S'mores. Should Gordon Biersch be concerned about this new competitor on the next block? Supporters of the proposed American nuclear deal with Iran will rally in the fountain area outside the Red Brick Courthouse at 29 Courthouse Square today, August 26, at noon in Rockville. The event is one of many planned nationwide today by a MoveOn.org-led coalition of groups. Participants will deliver 153 pages of signatures on a petition asking Congress to support the Iran deal, and will thank Congressman Chris Van Hollen (D - 8th District) for his support of the agreement worked out between political representatives of Iran and the Obama administration, the United Kingdom, France, China, Russia, Germany, and the European Union. "Community members will be delivering Congressman Chris Van Hollen a big 'Thank you!' for supporting the historic agreement to prevent Iran from obtaining a nuclear weapons production capability," Rockville resident and event organizer Rob Lovelace said Tuesday. "You probably might guess what we're going to say tonight, but act surprised," Max van Balgooy joked at the outset of last night's campaign kickoff for the reworked Team Rockville candidate slate. Van Balgooy, returning as the slate's campaign manager, had the right idea, given that the slate had become the worst-kept secret in Rockville over the last few days. Sima Osdoby, a 35-year resident of the city, officially announced her candidacy for mayor of Rockville, and will take on incumbent Bridget Donnell Newton in the November 3 contest. Osdoby has served on many city boards, and as Board President of Peerless Rockville. Joining her on the reshuffled slate, which swept all four council seats in the 2013 race, are former councilmember Mark Pierzchala, incumbents Julie Palakovich Carr and Virginia Onley, and newcomer Clark Reed. 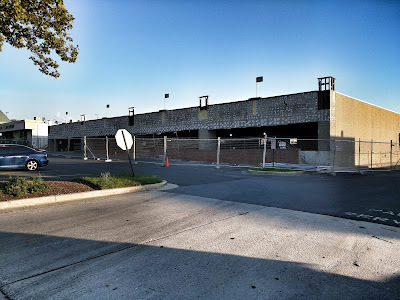 "Who is Clark Reed, anyway," Reed asked the crowded clubhouse at New Mark Commons, predicting the question Rockville residents who don't follow the doings of the city's Environment Commission may be asking themselves this morning. Reed is the chair of that Commission. A Twinbrook resident since 2002, Reed said he's running because "I really wanted to give back to the city." A co-founder of the Rockville Solar Co-op, Reed says his venture is "literally giving power to the people," having signed up 200 families for solar panels this year. Despite his rookie status in electoral politics in Rockville, he didn't shy away from taking a swipe at the current Mayor and Council. Reed argued that "personal grudges grew into dysfunction," producing a "continuous shower of negativity." Presumably referring to those who opposed weakening school capacity standards in the city's Adequate Public Facilities Ordinance, Reed said, "fearmongering is stopping us from moving forward." That divide over planning and development became the central theme of the evening. 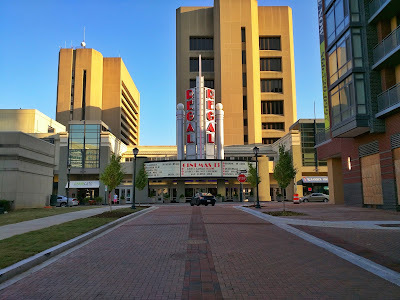 By event's end, one thing was clear - Team Rockville leans more toward the dense, transit-oriented redevelopment being implemented at the city's door in the Pike District, than the small town approach the city has followed outside of its town center for decades. Speaking of Town Center, it's in serious trouble according to Pierzchala. 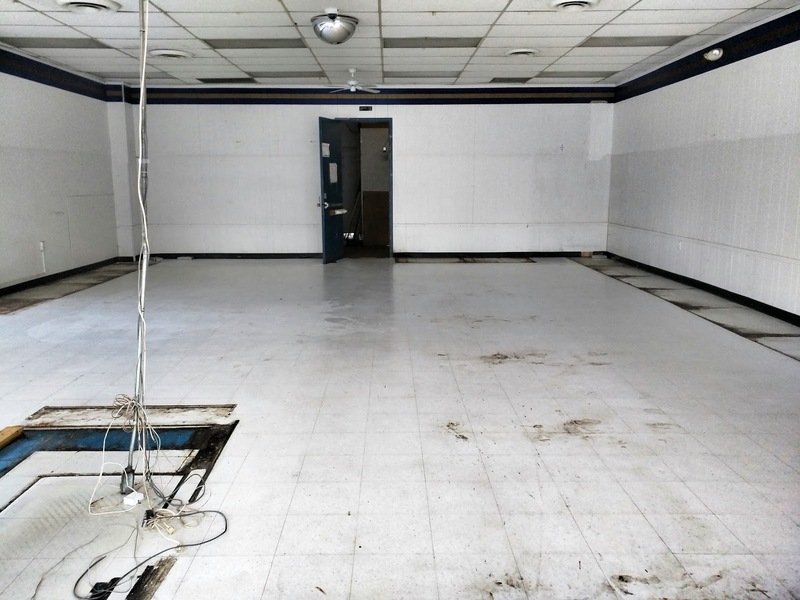 He noted he has counted 15 empty storefronts in the Town Center area. "That is stunning, given the amount of money we've spent," Pierzchala said, promising to "renew those [shopping] centers." Palakovich Carr cited the "problems ailing Rockville Town Center" as one of her priorities. Palakovich Carr spoke the least about development, however, positioning herself as an environmental and pedestrian safety advocate. Overhauling the city's Animal Control Ordinance and the establishment of a water conservation program are among her first-term accomplishments. She said Rockville should be a city "where no one loses their life or jeopardizes their safety" when walking or biking. She also noted her vote in favor of bringing the city's school capacity standards in line with Montgomery County's weaker standards, which has opened the entire city up for development. That 3-2 Council vote enraged a large, well-organized coalition of citizens. Palakovich Carr termed the dissenters a "vocal minority of naysayers" last night. Onley embraced her deciding vote on that school overcrowding issue. "I was responsible for bringing back the agenda item on the APFO/APFS," she said, to vigorous applause from supporters. She pinned the need for more housing on the growing number of millennials. Rockville needs more housing units "so that they can live in their city," Onley argued. "I swore I was never gonna join another slate," Onley recalled. She said the caliber of the new slate changed her mind, promising that Team Rockville will "keep their thumbs on the pulse of development" if elected. But mayoral candidate Osdoby gave perhaps the most aggressive speech of the evening, slamming unnamed elected officials by arguing "change is happening all around us, but critical decisions are not being made." And when decisions are made, the answer is "too often, 'No'," Osdoby said. "Doing nothing costs," Osdoby declared. "We're standing still. The future is passing us by." Criticizing the delay in the update of the Rockville Pike Plan, Osdoby charged "something's wrong here." Planning Commissioners recently defended the time spent on the plan as valuable in obtaining citizen input, and the fault of those on the Council who changed the APFS standards that were relied upon throughout the current draft. With those now out the window, the Commission said the Council knew their actions would delay the plan further. Osdoby somewhat ironically blamed Newton for "failing to forge consensus" as mayor, given that Team Rockville's message last night implicitly labeled a sizable group of Rockville residents as a "vocal minority" of "fearmongering" bad actors, who in Pierzchala's words, are "spending too much time fighting last century's battles." Not exactly words to bring the city together. Turnout was sizable for the last-minute event. Osdoby noted that the slate had only been working together for a few days, and "we've got a room full of people here." Notables in the crowd included former Mayor Rose Krasnow, current Councilmember Tom Moore, Maryland State Senator Cheryl Kagan (D - District 17), and former Planning Commissioners Jerry Callistein and Steven Johnson. Not all supporters were from the city, however. Former state Democratic Party chair Susie Turnbull, Somerset Mayor Jeffrey Slavin, and Montgomery County Planning Board Commissioner Natali Fani-Gonzalez were also in attendance. I asked Fani-Gonzelez, who recently became the first Latino commissioner ever appointed to the Planning Board, if she was endorsing the slate. She clarified that she was there not to officially endorse anyone, but because she served on the board of Emerge Maryland with Osdoby. Turnbull was a co-founder of Emerge Maryland. 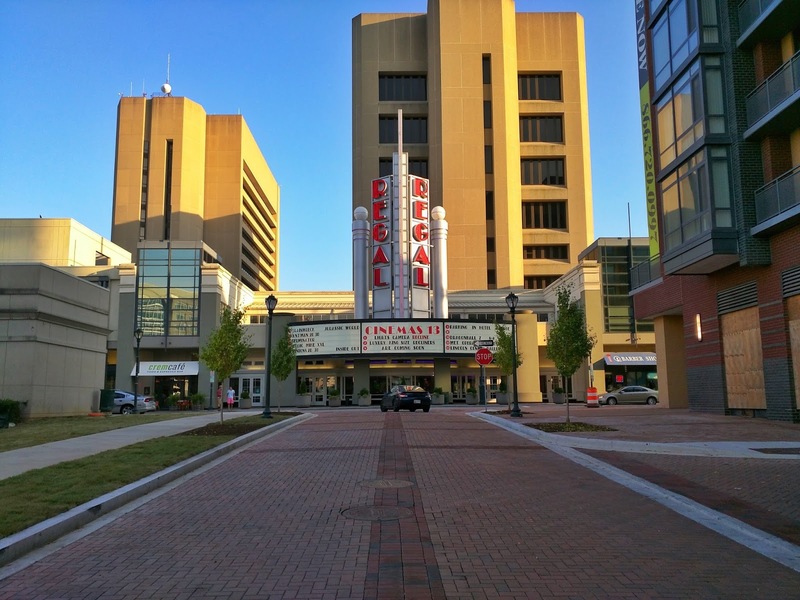 Team Rockville will compete against Newton, Council incumbent Beryl Feinberg, and challengers Brigitta Mullican and Richard Gottfried for the mayoral seat, and four council seats, on November 3. The voters who turned out in 2013 appeared to be undecided on what direction they wanted the city to take. Voters that year eagerly voted for the council candidates on Team Rockville, but chose Newton over Pierzchala. One could interpret that as a desire by the citizens to pursue many of the agenda items of Team Rockville, but wanting Newton as a check on that power. One could also interpret Pierzchala's decision to run for council this year, rather than mayor, as a tacit admission that Newton will be tough to beat. Or, perhaps the political ground has shifted since then. That's what makes elections exciting. The Montgomery County Planning Board does not have jurisdiction over the Confederate statue at Rockville's Red Brick Courthouse. But it plans to weigh in on the topic Thursday morning, September 3. According to the meeting agenda, the board will be briefed by Park and Planning staff on the statue. It will then be asked to name 3 parks it believes the statue should be placed in, should it end up in a park outside the city of Rockville. Finally, it will officially give its support of the statue's relocation. The statue is owned by Montgomery County and is located on county property. 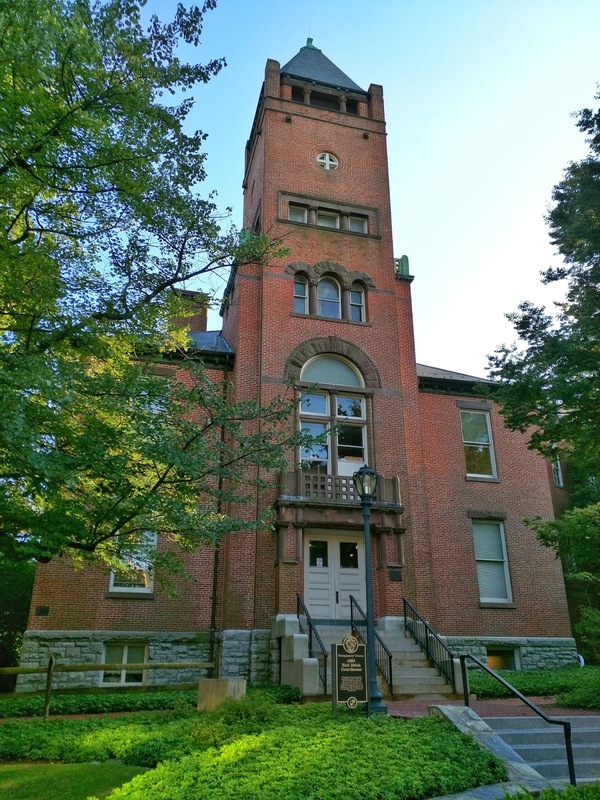 However, the County must formally apply to the Rockville Historic District Commission on September 17 to relocate it. Rumors have been flying since late last week that a new "Team Rockville" slate is being formed for the Mayor and Council elections November 3. Sima Osdoby has been said by several sources to be the new slate's mayoral candidate. There is no public confirmation of this yet, but The Seventh State reported Saturday that she will indeed challenge incumbent Mayor Bridget Donnell Newton. 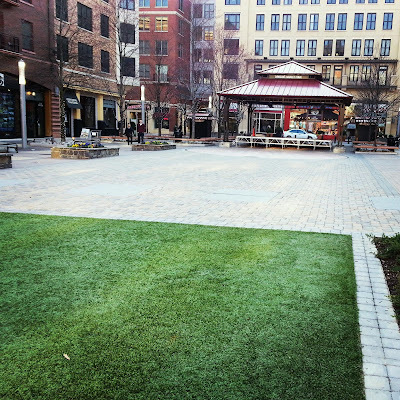 Speculation of a new slate picked up steam when incumbent Councilmember Virginia Onley announced that she would be making an appearance at the council campaign kickoff of former Rockville City Councilman Mark Pierzchala tonight. Who else is rumored to be on the as-yet-unnamed slate with Osdoby, Onley and Pierzchala? Sources suggest they will be incumbent Councilmember Julie Palakovich Carr, and Rockville Environment Commission Chair Clark Reed. Any potential slate would square off against council challengers Brigitta Mullican, Richard Gottfried, and incumbent Councilmember Beryl Feinberg. The Twinbrook Citizen's Association is hosting a free homeowners' property tax credit workshop on Tuesday, August 25, from 1:00-3:00 PM, at the Twinbrook Recreation Center at 12920 Twinbrook Parkway. 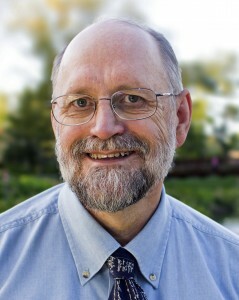 Richard Gottfried, CPA (and president of the TCA), will be the speaker. Bring your 2014 federal tax return to the event. According to the event announcement, if your household income is less than $91,000 per year, and your net worth is less than $200,000 (not including the value of your home or qualified retirement savings), you could qualify for tax relief on the first $495,000 of your home's assessed value. For questions, or to RSVP (it's not required to RSVP), email Richard Gottfried at richgott3 [at] verizon [dot] net. New Team Rockville slate for Mayor and Council forming? Having a formal slate of candidates is one Rockville electoral tradition that doesn't seem threatened with extinction anytime soon. Just when it seemed that 2013's Team Rockville slate was history, the 2015 contest is threatening to get interesting again. 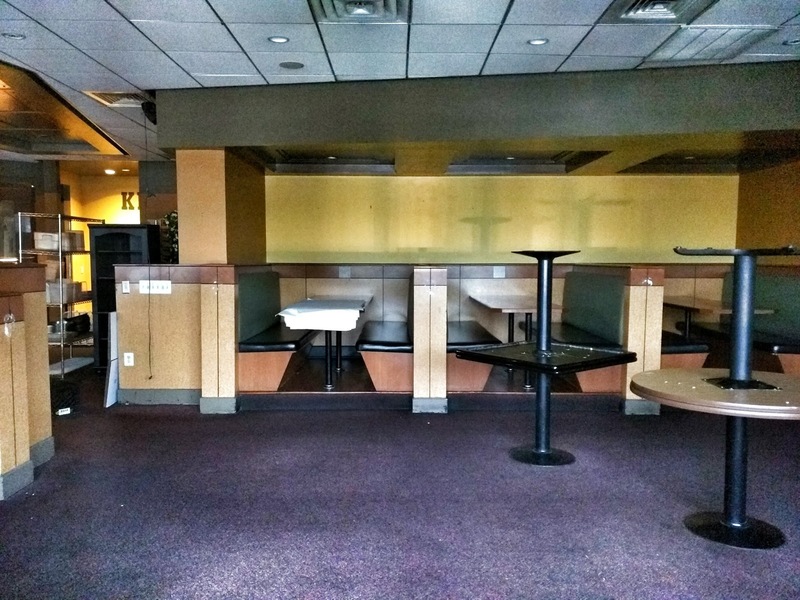 Thursday's announcement by former Rockville City Councilman Mark Pierzchala that he is seeking a return to his old seat was followed Friday by a cryptic Facebook post from a former Team Rockville teammate. 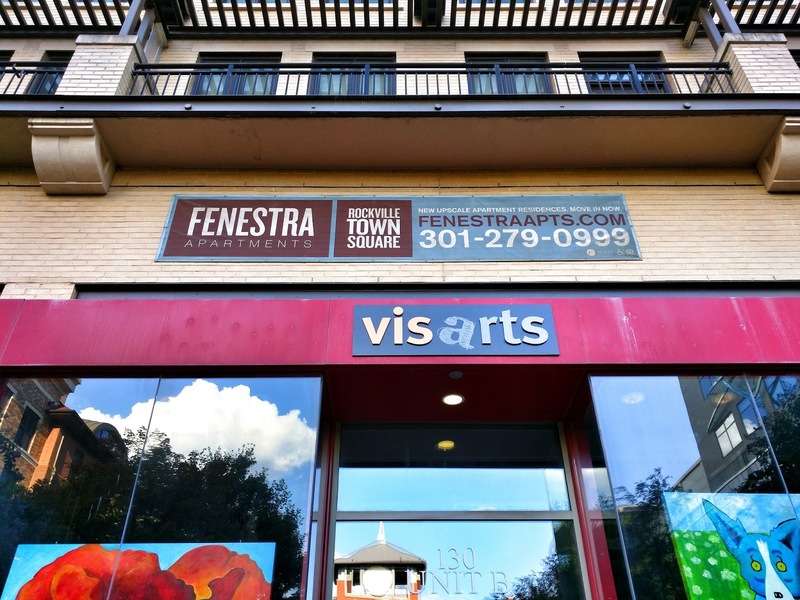 Incumbent councilmember Virginia Onley hinted at a big announcement she plans to make "about the upcoming Mayor and Council elections" Monday evening. The interesting part? Her announcement will be at the same time and place as Pierzchala's previously-scheduled campaign kickoff event. Former Rockville City Councilman Mark Pierzchala wants his old seat back. Pierzchala announced his candidacy Thursday evening in a message to friends and supporters. He will be holding a campaign kickoff event Monday night, August 24. In his announcement, Pierzchala cited his "financial and budgetary expertise", promotion of economic development, and fiscal conservatism on the council "during the Great Recession." The former councilman has expertise in survey methodology and statistics, and runs a Rockville-based consulting firm specializing in those areas. Pierzchala was a member of the Team Rockville slate as a mayoral candidate in 2013. Outgoing councilmember Tom Moore was a member of that slate, as well. Moore recently hinted that he would be backing candidates in the November 3 election, and would reveal his plans to that end in the near future. However, Team Rockville did not always vote as a bloc. The most constant two Team Rockville votes on the council have come from Moore and Councilmember Julie Palakovich Carr. Councilmember (and former Team Rockville member) Beryl Feinberg more often voted with Mayor Bridget Donnell Newton on controversial issues that drove angry citizens to testify at City Hall, such as the weakening of the standards on school overcrowding, proximity of self-storage facilities to schools, and backyard chickens. Feinberg is not running as part of a slate in this election. Councilmember Virginia Onley also voted independently from her Team Rockville colleagues many times, often seeking to find a middle ground between disparate positions. In fact, Onley, Feinberg and Newton were more often than not a strong, 3-vote bloc as the current council term unfolded. But Onley cast the decisive vote to weaken school capacity standards, reversing her position a few months earlier to join Moore and Palakovich Carr. One of the more interesting things we'll find out this fall in Rockville, is whether the APFS school standards votes will have any impact on the election results. Pierzchala has not yet announced if he will run as part of any slate in this election, but promises to offer more details on his campaign Monday night. The security check policy applies to bags, backpacks and packages, including purses. 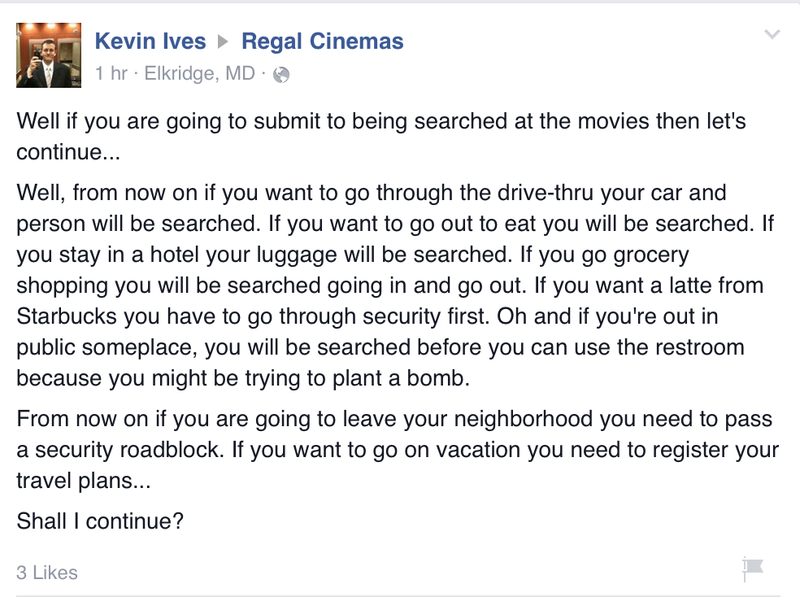 Regal's corporate Facebook page is blowing up with customer backlash against the new policy, with many patrons feeling their 2nd and 4th Amendment rights are being violated. A few posters thanked the chain for ensuring their theaters would be gun-free zones. 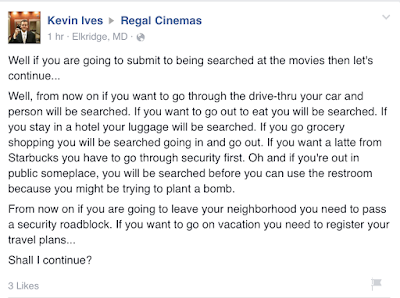 However, Regal's policy does not explicitly state which legal or illegal items would not be allowed to be brought into the theater. Nor does it specifically refer to firearms, even though it would seem obvious that weapons and explosives would be the primary intent of the policy. Such a policy would not have prevented the infamous Aurora, Colorado theater mass shooting in 2012. In that incident, the shooter left the theater through the emergency exit. He then retrieved weapons, explosives and other materials from his car, and re-entered through that exit, which he had propped open enough to prevent it from locking. That case made clear the security issues caused by a lack of ushers regularly patrolling theaters, as they once did not that many years ago. 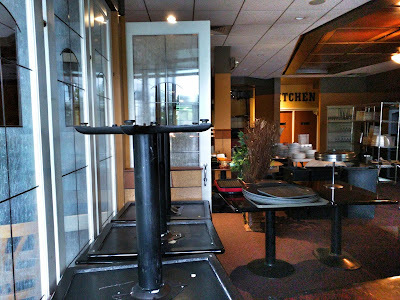 Had an usher simply ensured that door was closed on a routine walkthrough, and thereby locked to outside intruders, the shooter would have been foiled. A third public meeting on the Southlawn Industrial Area Feasibility Study, a land-use and compatibility study that is currently underway, will be held on Thursday, September 10, 2015, from 6:30-8:00 PM at the Lincoln Park Community Center. The center is located at 357 Frederick Avenue in Rockville. VHB, the consultant hired by the city, will give a short presentation on its latest findings and analysis. Questions and comments from residents and business owners will be taken afterward. This feedback will be utilized in preparing the study's final recommendations. 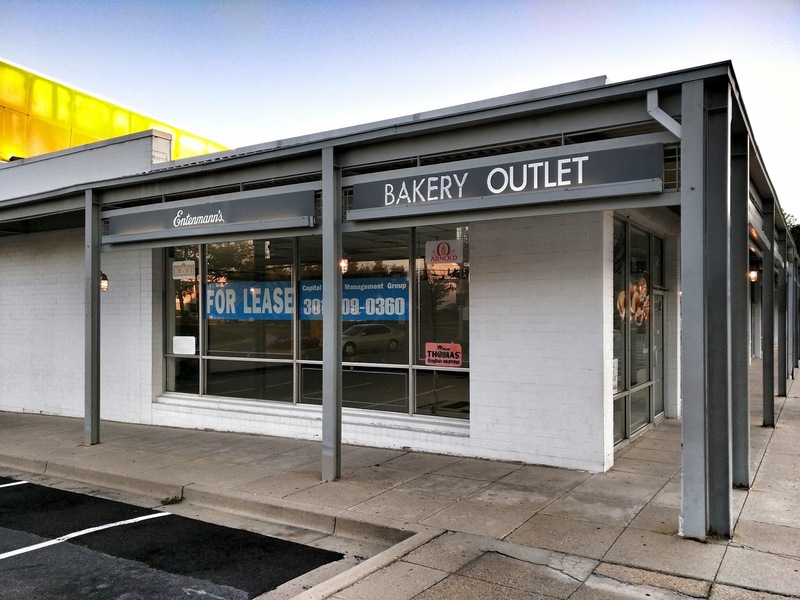 The study is designed to identify compatibility problems between the Southlawn area's industrial uses and adjacent neighborhoods, as well as consider future opportunities to improve the area, and what types of development should be considered there. For more information, visit the city's website on the study. The agenda for the Rockville Historic District Commission for its Thursday, August 20 meeting includes an "update on HDC meeting with Twinbrook Citizens Association." 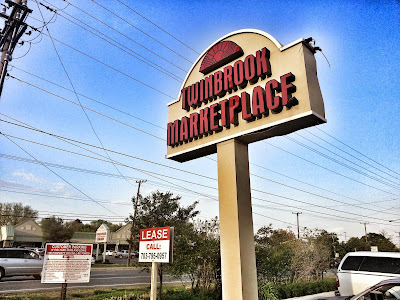 Discussion of historic preservation options for the Twinbrook neighborhood, and a potential meeting with their association, has been postponed at least twice this year. The talk of such options has raised some concerns among Twinbrook homeowners, and the topic was discussed at the TCA meeting in April. Many Twinbrook homes fall within the 50-year window for consideration as historic, Commissioner Jessica Reynolds noted this past March. Other notable items on Thursday's agenda include an update on a draft Historic Preservation text amendment, and a courtesy review of the proposed new ADA-compliant parking lot for the F. Scott Fitzgerald Theatre and social hall. Thursday's meeting will be at City Hall, and will begin at 7:30 PM. 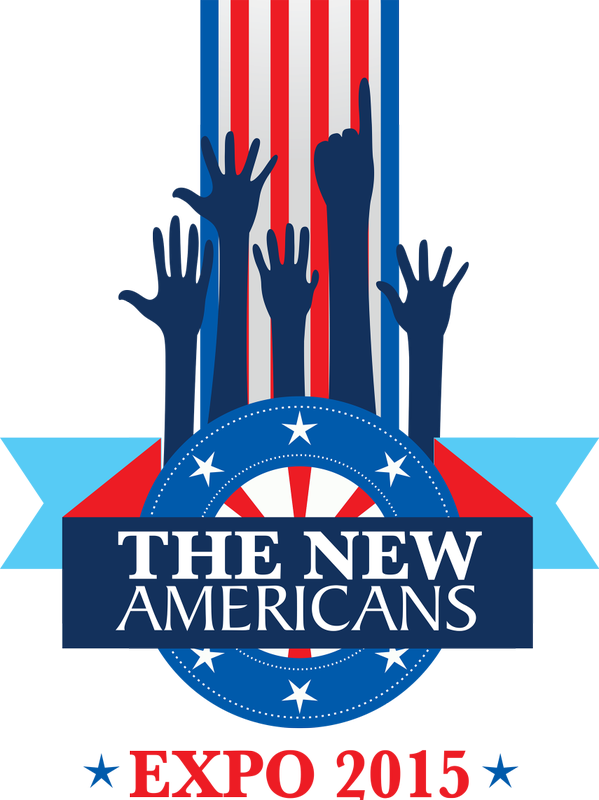 Nonprofits, businesses and government agencies will gather at the Silver Spring Civic Center on October 4 from noon to 6:00 PM for the New Americans Expo 2015. The event is a one-stop shop for new Americans to learn about programs, services and products that will help them in adapting to and navigating life in America. This year's expo is being led by 4 New Americans Ambassadors, YouTube personality and model Cindy Gamez, Kemi Fadojutimi of the TV show All Eyes on Africa, Miss Maryland 2013 Lyz Denizard, and John Cabrera of CF Alliance. Attendees will be able to get information and assistance on legal services, insurance, banking, education, travel, how to obtain a driver's license, and employment options. There will also be live music and performers, including singer-songwriter David Amaya, who is composing a song specifically for the event. Giveaways will include free toys for kids. Two awards will be given during the afternoon - a Community Inclusion award for a local nonprofit, and an Appreciation Award for the organizations and volunteers participating in the expo. Proceeds from the New Americans Expo 2015 will be distributed among four nonprofits that serve the immigrant community: Catholic Charities, Identity, El Poder de Ser Mujer and Etnika Foundation. Admission to the event is free. You can register online. Organizaciones no lucrativas, empresas y agencias gubernamentales se reunirán en el Centro Cívico de Silver Spring, el 4 de octubre desde el mediodía hasta las 18:00 de la Expo Nuevos Americanos de 2015. El evento es una ventanilla única para los nuevos estadounidenses a aprender sobre programas, servicios y productos que les ayudará en la adaptación a la vida en Estados Unidos. Expo de este año está siendo dirigido por 4 nuevos americanos Embajadores, YouTube personalidad y la modelo Cindy Gamez, Kemi Fadojutimi del programa de televisión All Eyes on Africa, Miss Maryland 2013 Lyz Denizard, y Juan Cabrera de CF Alianza. Los asistentes podrán obtener información y asistencia sobre servicios legales, seguros, banca, educación, viajes, cómo obtener una licencia de conducir, y las opciones de empleo. También habrá música y artistas en vivo, incluyendo el cantautor David Amaya, quien está componiendo una canción especialmente para el evento. Sorteos incluirán juguetes gratis para los niños. Dos premios se entregarán durante la tarde - un premio de Inclusión Comunitaria para una organización no lucrativa local y un premio de la apreciación de las organizaciones y voluntarios que participan en la feria. Producto de la New Americans Expo 2015 se distribuirán entre cuatro organizaciones no lucrativas que sirven a la comunidad de inmigrantes: Catholic Charities, Identity, El Poder de Ser Mujer y Etnika Foundation. La entrada al evento es gratis. Rockville Councilmember Tom Moore has made his election decision - he won't be running again this November for the City Council. Moore made the announcement in an email to supporters Friday. He cited the time public service has taken away from his family as the major factor in his decision, writing that "my family has paid a high price while I have campaigned and governed virtually nonstop over the past six years, and it is time for me to turn my attentions homeward." Moore's announcement also cited his accomplishments on the council, including preserving Fireside Park Apartments as affordable housing, tougher ethics rules, limiting retention of citizen data by Rockville Police license plate readers, and his successful effort to weaken the city's school overcrowding rules over vehement, well-organized resident opposition. The latter victory has opened the entire city to new development proposals, as no schools are deemed over-capacity under the new rules. While Moore did not divulge any future political plans, he did hint that he will be throwing his support behind some of the candidates running for council seats this fall. Moore ran an unsuccessful campaign for the District 3 seat on the Montgomery County Council in 2014, losing to Gaithersburg Mayor Sid Katz. Moore's decision ensures there will be at least one new face on the council in the next term. 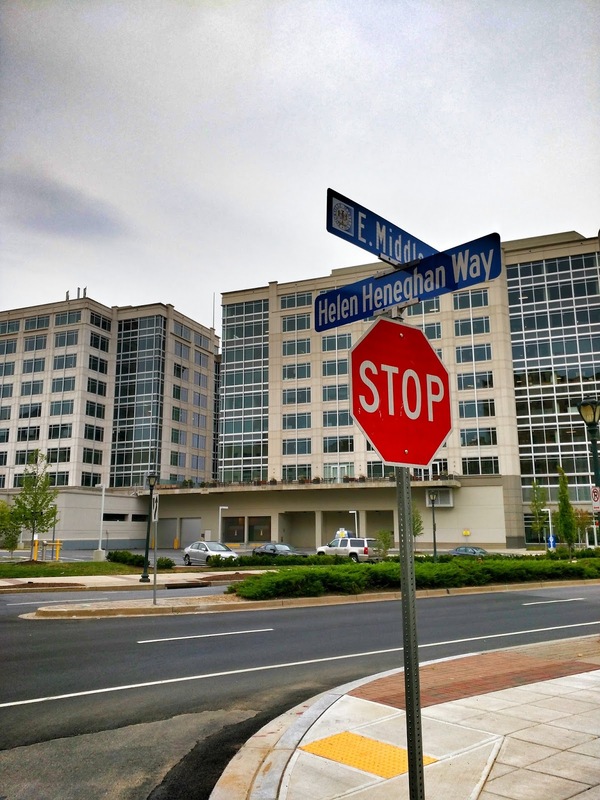 Bethesda-based real estate firms 1788 Holdings and Lantian Development have announced they are acquiring several Class B office buildings off of Shady Grove Road in Rockville. 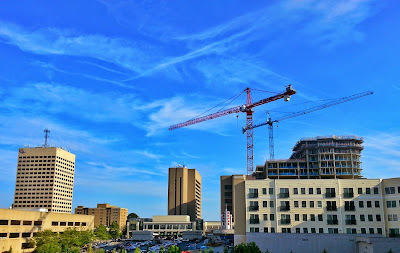 The site is about a mile from the Shady Grove Metro station, and adjacent to JBG's Upper Rock redevelopment projects. 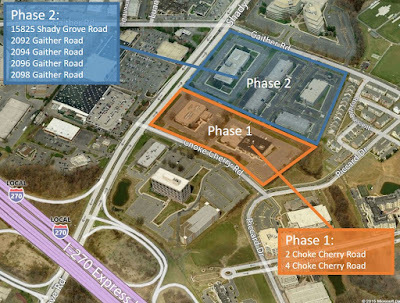 It is also across Shady Grove Road from the 270 Center shopping center. These acquisitions are intended as a long-term investment for the partners, they say. The plan is to position the properties for both a short-term and long-term return. Five office buildings: 2092 Gaither Road; 2094 Gaither Road; 2096 Gaither Road; 2098 Gaither Road and 15825 Shady Grove Road, will be renovated and upgraded to attract new office tenants. Eventually, two office buildings at 2 Choke Cherry Road and 4 Choke Cherry Road will be demolished. In their place, a mixed-use project will rise with ground-level retail, and residential units and hotel rooms above. Anchored by a yet-to-be-named grocery store, the development's name, branding and architectural design are scheduled to be unveiled in early 2016. In a statement, Montgomery County Executive Ike Leggett said "the County is impressed with this plan." However, the County does not have planning jurisdiction over the properties - the City of Rockville Planning Commission will be the approving body. The properties' seller was TA Associates. 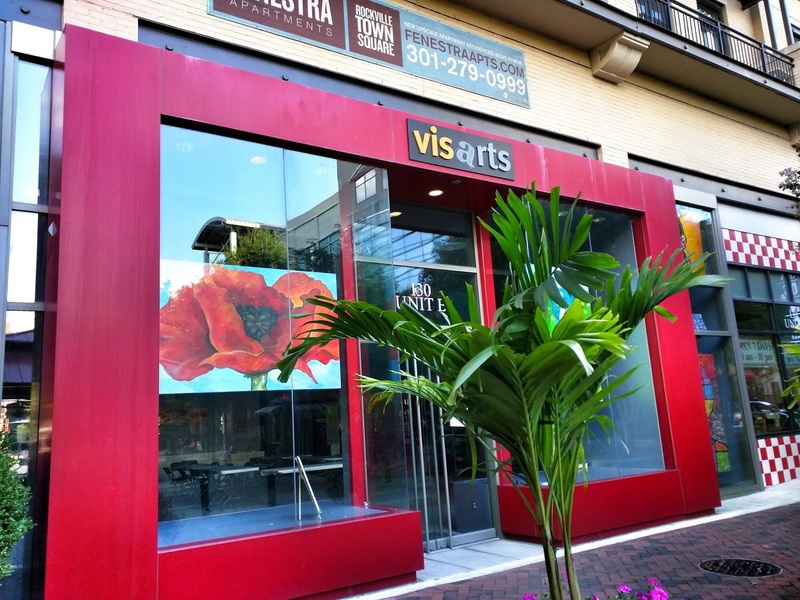 VisArts has made its use of the former Cloud 9 boutique space at Rockville Town Square a bit more formal. While it has been making use of the space for several weeks, there is now VisArts signage on the storefront. 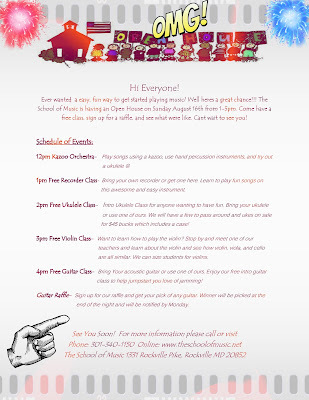 The School of Music on Rockville Pike will be holding an open house this Sunday, August 16, 2015, from 1:00-5:00 PM. Every hour, there will be hands-on classes, where you can bring your own instrument, or use one of theirs. You can also enter their raffle, to win a guitar of your choice from their collection. The winner will be announced the following day. 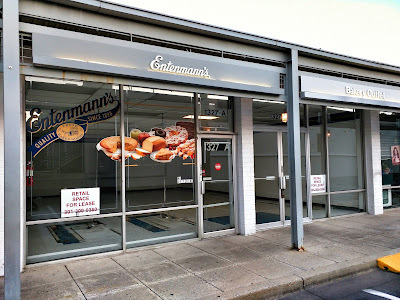 One of Rockville's most unusual retail stores was the Entenmann's Bakery Outlet at 1327-A Rockville Pike. Alas, the maker of hard-to-resist Chocolate Frosted Donuts and Chocolate Chip cookies has closed this location. The store has packed up and moved to Jessup, and the space is for lease. 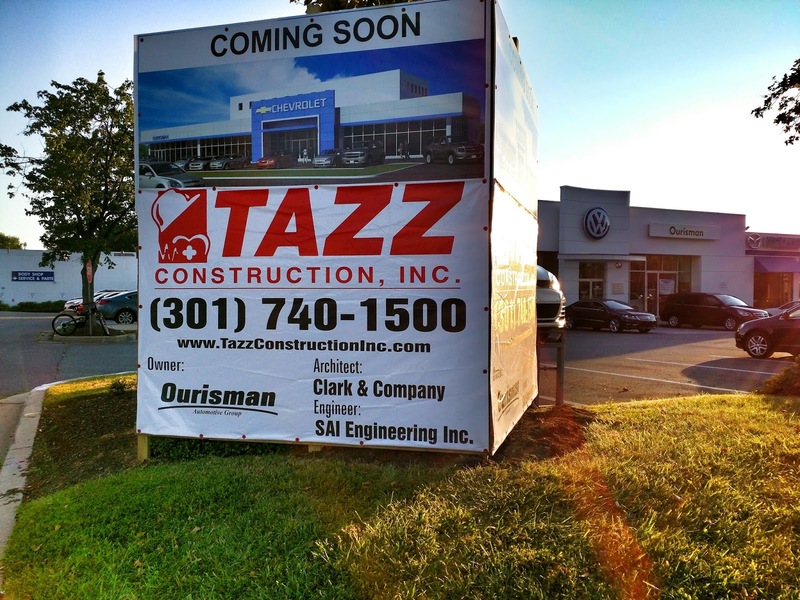 Ourisman Rockmont Chevrolet is indeed moving down Rockville Pike to Wintergreen Plaza. An employee of the dealership confirmed the plans, and said the move will likely occur after Labor Day 2016 - which sounds like a long time in the future, given that this isn't an apartment tower that's being built. 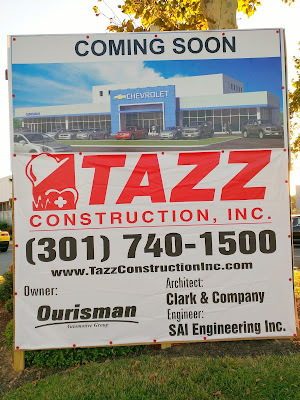 The new dealership, currently under construction, will also offer Chevrolet service. Based on the renderings of the future dealership, it will feature the latest Chevrolet facade design, which you may have seen elsewhere in the region. What it won't have, is the huge storage lot the existing Rockmont site has, meaning a lot of that Chevrolet inventory will have to be moved somewhere else. 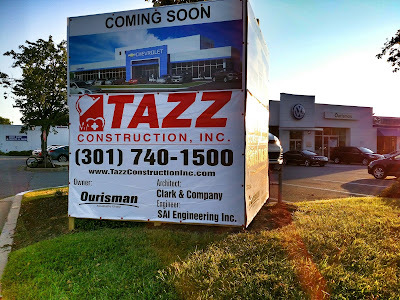 The larger question, however, is the development potential of the current Ourisman Chevrolet site at MD 355 and Gude Drive. It is one of the largest auto dealerships on this side of the county, making the site a sure target for redevelopment.